The U.S. Department of Education's Robert Shireman compared the growth of for-profit colleges like Corinthian, the Art Institute and Strayer, all of whom have announced that they will establish campuses in Milwaukee, to the Wall Street firms that caused the nation's financial collapse. Shireman called the colleges out by name for the vast and quickly increasing sums of federal student aid money they are drawing down and noted that most of them are accredited by agencies composed of their peers, creating a conflict of interest reminiscent of that between Wall Street and the accrediting agencies that turned a blind eye to the reckless trading that created the worst financial panic since the Great Depression. The full story from Inside Higher Ed is linked. While the fringe that controls (Arizona) state government goes after the fastest-growing ethnic group in the country with a law that makes a mockery of American values, Arizona crumbles. Its state parks are orphans, left to volunteers. Its university system is being slashed and picked to death. They even considered a plan to sell the House and Senate buildings. What business will want to relocate to such a place? It will cost these hot-heads running the state. Probably not this year. But soon enough, because Americans have always considered the West a place that looks to tomorrow through a lens of hope, instead of hiding in the past, in fear. More than 65% of Midwest chief financial officers and senior comptrollers said cutting corporate and personal income taxes is the best way to create jobs, according to a national survey conducted by Grant Thornton this month. Thirty-five percent of those polled said cutting personal income taxes would be most effective in creating employment opportunities, while 32% said cutting corporate tax rates would best allow companies to hire. What will the MJS tell us next, that alcoholics prefer beer to sparkling water? Economic policy, including tax policy, should be based on facts not opinions, even those of highly paid CFOs. The United States enacted the largest tax cut in its history in 2001 ($1.3 trillion) and followed that up with additional capital gains and dividend tax cuts in 2003. The total value of the 2001-2003 tax cuts was $1.8 trillion. More than 50% of the $1.8 trillion tax cuts went to the richest 1%, CEOs and CFOs included who averaged over $900,000 annually. The result-the weakest job creation of any post World War II business cycle. If cutting top marginal income rates led to job creation we should have had a job boom. Instead we had the opposite. And a large proportion of the private sector jobs that were created (finance, real estate and construction) were the result of the housing bubble. Once that burst all of those jobs were eliminated. We experienced much greater job growth during every other post WWII business cycles, including those in the 50s, 60s, 70s and 90s, when the top marginal tax rate was significantly higher than it was during the 2001-2007 business cycle. High income personal income tax cuts, such as the 2001 tax cuts or those advocated by the CFOs, are weak economic engines because high income earners are less likely to spend their additional income than less affluent people. One of the main reasons the United States developed the world's strongest and most innovative economy is that it invested in education. The commitment to provide free, universal public education made it possible for tens of millions, the children of farmers, sharecroppers and workers, many of who were immigrants from Ireland, Eastern and Southern Europe, China and elsewhere, to master the language and numeracy skills they needed to contribute to the growth of the nation and its democracy. In establishing the University of Virginia and in his support for land grant colleges like the University of Wisconsin, Thomas Jefferson established a national precedent of public support for higher education that has continued until recent years. Progressive states like Wisconsin built on these traditions by investing in vocational schools which today have developed into the Wisconsin Technical College System, a sophisticated post- secondary education and training system that provides local industry with the skilled workers and technicians it needs. But in the last few years, the nation's thirty year romance with reducing taxes has combined with the Great Recession to undermine education funding at all levels. The nation's public schools are now approaching, in the words of U.S. Secretary of Education Arne Duncan, "an education catastrophe" as state budget cuts will eliminate between 100,000 and 3000,000 teaching positions. Last year the American Recovery and Reinvestment Act was responsible for preventing 342,000 teacher layoffs, 5.5% of the country's total K-12 teaching jobs. But this year with no additional stimulus dollars massive layoffs are expected. 90% of the nation's school districts plan to layoff teachers in the fall, up from 66% last year. Districts in California have given pink slips to 22,000 teachers. Illinois authorities are predicting 17,000 and New York is projecting another 15,000 position will have to be eliminated to balance the budget. Across Wisconsin from Milwaukee to the Fox Valley, from Madison to Stevens Point and Menasha, teaching positions are being cut. A record 13% of the nation's school districts are considering a four day school week. Deficit hawks will argue that we have to live within our means; that we just can't afford to keep all of these teachers. They disingenuously assert that if we spend more federal money on teaching our children we have to cut other federal spending to prevent the deficit from growing even larger. They are proposing cuts in education in the name of the protecting our children and grandchildren from having to pay the nation's growing debts. This is nonsense. 66% of the federal budget is non-discretionary spending like Social Security, Medicare and interest on the debt. It cannot legally be cut. Half of the remaining third is national defense spending which is for all practical purposes non- discretionary when the nation is fighting two wars. That leaves only 17% of the federal budget that can be cut. And that 17% includes education, job training, veterans benefits, food stamps, unemployment benefits, justice, environment, and research and development. What exactly do they propose we cut to pay for education? Education? Job Training? Veterans benefits? A nation that can't afford to educate its citizens is a nation that will not prosper. Education is an investment in the future of the nation, its economy and its people. Most economists agree that it is necessary to go into debt to jump start the economy and or to make investments in education, science, research and development and infrastructure; investments that are the basis for increased economic growth and prosperity. If we fail to make these strategic investments, economic decline is assured. Cuts on the scale being projected also threaten the nation's economy recovery. While the economy has begun to grow, unemployment and underemployment continue to hold back growth. The federal stimulus provided a temporary increase in demand that prevented the severe recession from becoming a depression. But most of that money has now been spent. Eliminating 300,000 teachers will lead to a significant reduction in demand that could undermine the weak recovery causing a double dip recession. Iowa Senator Tom Harkin has proposed a $23 billion school bailout bill that will help schools across the nation avoid the catastrophic layoffs that are planned. Congress should pass this bill! A year and half ago Congress bailed out CitiGroup, Goldman Sachs and other Wall Street banks. The deficit hawks didn't demand cuts in federal spending to provide Wall Street with hundreds of billions of dollars. Is it more important for us to keep these private investment firms alive than it is to educate our young people? Are we more more committed to investing in Wall Street speculation than in the real economy and people that produce goods and services? Congress needs to pass Senator Harkin's emergency education funding bill now. Otherwise, we will get exactly the kind of nation we won't pay for. An examination of recent mine disasters reveals that accidents happen far more often in non-union mines. As United Steelworkers President Leo Gerard, whose union is one of two major U.S. unions representing mine workers, said:"This is another series of fatalities at another non-union mine." "I can absolutely say that if these miners were members of a union, they would have been able to refuse unsafe work in our collective agreements, and they would have been able to refuse that work, and would not have been subjected to that kind of atrocious conditions." Gerard blasted the culture "that developed during the Bush years that was against regulation, against enforcement," and noted, "we’ve seen a marked improvement since the appointments of the Obama administration into Occupational Safety and Health Administration and the Mine Safety and Health Administration, despite the holds placed by some Republicans. But that’s only part of the story, as Gerard noted:"The CEO of Massey promotes himself as a union buster, promotes himself as having a record of fighting unions wherever they show up in his work place. If he spent as much time helping the workers get a union and helping us clean up his workplace we wouldn’t have these fatalities, we wouldn’t have these fines." Massey’s accident is hardly the first that falls into this category. Following the death of 12 miners at an explosion in January, 2006 at West Virginia’s Sago Mine, which had been cited for 200 safety violations during the prior two years, a hearing was held by the House Education and Workforce Committee. Among those testifying were miners who had worked at both union and non-union mines. "So I got a good taste of both sides of the spectrum," Randy Duckworth of Farmington, West Virginia told the committee. "When I was at a union-represented mine, I was greeted with a safety committee appointed by the union to oversee the health and welfare of those employees." At a non-union mine Chuck Knisell of Morgantown, W Va., was ordered to do several things he regarded as unsafe. "I didn’t like to do it, but (my boss) said, ‘if you don’t like it, there’s the track... You’re not going to have a job. We’ve got a stack of applications this thick." As Rep. George Miller put it, "people are in a situation where they can be intimidated if they speak out because they really don’t have the security of a safety committee" and "union representation." "A union presence at the Sago mine might well have prevented the disaster." McCollester cited the numerous safety precautions won by unions in mines they represent, and added that union mines do a better job resisting efforts by cutthroat employers to slash safety standards or install "dubious products." "Critically, workers in a union mine are not afraid to speak. In a non-union operation, asking questions or challenging company mining practices or safety procedures can lead to termination. The company’s fear of knowledgeable, independent inspects was illustrated in their attempt to bar the entry of UMWA at Sago." Murder in West Virginia coal fields-miners deserve justice! The nation's coal mining safety laws are written in miners’ blood. Twenty-five miners died in the non-union Upper Big Branch Mine owned by the Massey Energy Company. Twenty-five men are dead because of the Massey Energy Company's ruthless pursuit of profit, zeal for deregulation and blatant disregard for the welfare and safety of the hard working men it employs. When Massey's anti-union chief executive Don L. Blankenship arrived at the mine at 2 a.m. Tuesday morning, escorted by at least a dozen state and other police officers, the crowd of miners and their families screamed at him about caring more about profit than miners' lives. One miner threw a chair, a surviving father and son stormed off screaming they were quiting the mine and others yelled at Blankenship that he was to blame, before he was quickly escorted away. The Massey Energy Company, the biggest coal mining business in central Appalachia has been subject to sharp scrutiny and fines from regulators over its safety and environmental record. Several of its violations have been for improperly ventilating methane which is suspected to have caused the blast. While the cause of Monday’s disaster is under investigation, the deadly blast raises serious questions about Massey’s attention to safety under the leadership of Don L. Blankenship, and also why stricter federal laws, put into effect after a mining disaster in 2006, failed to prevent another tragedy. The Upper Big Branch mine, according to federal records, was an accident waiting to happen. It was cited for 458 violations in 2009, double the amount from any previous year, many involving poor ventilation of dust and methane, failure to maintain proper escape routes and the accumulation of combustible materials. Massey’s chief executive, Don Blankenship, has long invited criticism. He spent an extraordinary $3 million to buy the election of a Supreme Court judge, who then returned the favor by throwing out a major damage award against the company. He is a deregulation zealot who has contributed hundreds of thousands of dollars to the Republican Party. In the past two months, miners had been evacuated three times from the Upper Big Branch due to dangerously high methane levels, according to two miners who asked for anonymity for fear of losing their jobs. Representative Rahall II said he had received similar reports from miners about recent evacuations at the mine, which as recently as last month was fined at least three times for ventilation problems, according to federal records. In 2008, one of Massey's subsidiaries paid what federal prosecutors called the largest settlement in the history of the coal industry after pleading guilty to safety violations that contributed to the deaths of two miners in a fire in one of its mines. That year, Massey also paid a $20 million fine — the largest of its kind levied by the Environmental Protection Agency — for clean water violations. One of those things is a union so that miners can report unsafe, even deadly working conditions without fear of losing their jobs. This isn't a matter a matter of speculation. If you're an underground coal miner, your chances of emerging alive at the end of your shift are better if you work in a union mine than if you don't. In 2007-2009, there were 45 underground coal-mining fatalities. Only six of these were in union mines. 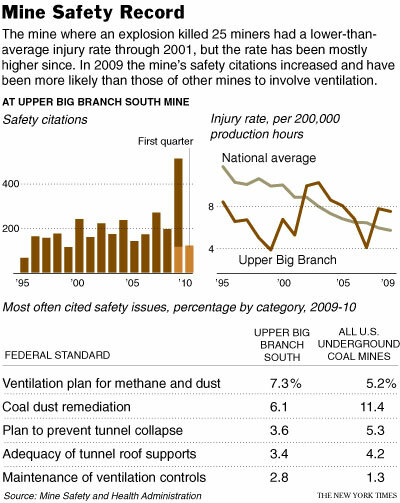 Thus, for the 15-year period, less than one-fifth of the fatalities occurred in union mines. Another thing is the aggressive enforcement of the nation's mine safety laws. Yet Blankenship and Massey vigorously fought the enforcement of these regulations. Twenty-five miners, grandfathers, fathers, sons, uncles, and nephews, are dead because Massey and its CEO have arrogantly flaunted the nation's mine safety laws.Investigations are sure to follow. But too often investigations are the only response. After the nation's attention fades, so do the demands for action. The twenty-five miners who died in the Massey mine and their families deserve more than speech-making and another study. So do future generations of coal miners who will continue to toil underground. They deserve justice. The Massey Energy Company and Don L. Blankenship should be charged with murder. New Yorkers for Fiscal Fairness has just launched a media campaign all across the state aimed at urging the Legislature to help save New Yorkers from losing even more jobs during these tough economic times. While Wall Street has largely recovered from the economic crisis and reaped record profits in the last year, Main Street continues to suffer from the fallout of the economic crisis. It seems like corporations are doing better than the rest of us. Make Corporations Pay Their Fair Share! by NYFF from New York State AFL-CIO on Vimeo. Twenty-five miners, grandfathers, fathers, sons, uncles, and nephews, are dead because Massey and its CEO have arrogantly flaunted the nation's mine safety laws. Investigations are sure to follow. But too often investigations are the only response. After the nation's attention fades, so do the demands for action. The twenty-five miners who died in the Massey mine and their families deserve more than speech-making and another study. So do future generations of coal miners who will continue to toil underground. They deserve justice. A recent Denver Post report on the troubling record of for-profit colleges in Colorado is a cautionary tale for Milwaukee as it awaits the opening of Corinthian Colleges Inc. The Post's examination of graduation rates, loans, default rates and other federal data disclosed that for-profit schools generally underperform their public and nonprofit counterparts and have a record of misleading students about job placement, credit transfer and potential incomes. ...with that growth (of private for-profit colleges) have come complaints and lawsuits over recruiting practices, tuition costs and the ability of graduates to land jobs in their fields of study. There also is growing concern in Washington, D.C., about the graduates' ability — or inability — to repay the millions in federal loans for- profit students take out to pay tuition. • For-profit students are defaulting on their loans at much higher rates than students enrolled in public or private nonprofit schools. Twenty-three percent of students who attended Colorado for-profit schools were in default in the first three years they are required to make payments, according to a Denver Post analysis of 2009 federal Department of Education data. • Tuition rates are high. Associate's degrees usually run $30,000 to $40,000, and bachelor's degrees usually cost between $60,000 and $75,000 at for-profit colleges. That compares with Metropolitan State College of Denver, where a three-year bachelor's degree runs about $12,900, and the University of Colorado at Boulder, where the cost is $29,000 for in-state students. • Taxpayers are paying for it. Last year, Colorado students received $1.6 billion in federal loans and Pell grants. Of that, $690 million went to for-profit schools, according to an analysis of federal loan data. Critics say problems often begin the moment potential students reach out to the for-profit college. Colleges are allowed to compensate admissions representatives based, in part, on the number of students they sign up. Critics say that makes the process less of a counseling session and more of a sales job. "Whenever you pay someone such as a recruiter based on numbers they bring in, you're just opening the door for abuse," said Rich Williams, a higher education associate with the Public Interest Research Group in Washington. Aggressive recruitment strategies is a key allegation made in a complaint against Westwood College, a Denver-based online and career college...The complaint alleges Westwood engaged in "deceptive and illegal trade practices" by failing to disclose the total cost of the education program and misleading potential students about job placement opportunities and the ability to transfer credits to other schools. The entire Denver Post expose is linked here.